Park Chan-wook’s extreme thriller courted controversy on its cinematic release largely due to the brutality of its violence and a particularly stomach churning scene featuring an octopus. Nonetheless, it took the Grand Prize at Cannes and went on to widespread success. 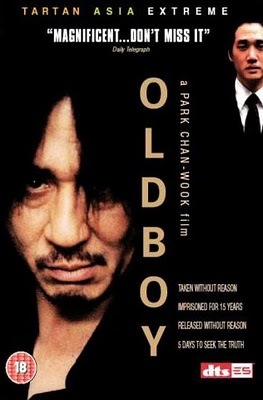 Oldboy focuses on Oh Dae-su (Choi Min-sik), a man inexplicably kidnapped and imprisoned for fifteen years. Upon his release, he is provided with a wallet full of cash and a mobile phone. A mysterious caller invites him to figure out the reason behind his detainment. A girl appears and promises to help him, and thus begins a brutal quest for answers… and revenge. Immediately, the film puts the audience at the heart of the action. We meet Dae-su at the police station where he is being held on a charge of drunk and disorderly. Handheld cameras sway unsteadily around the protagonist, positioning the viewer in the same queasy world as the character. This claustrophobic intensity increases still further as Dae-su is plucked from the streets of Tokyo and incarcerated in his locked bedsit. Here, the camera pans around him in a hallucinatory scene where ants burst from his flesh. Although the audience is not explicitly asked to side with Dae-su, it’s difficult not to feel some sympathy for him as he goes stir-crazy pondering his fate – and what has caused his current predicament. That this is achieved despite his obnoxious behaviour in the police station begs the question, “Why?” Possibly the answer to this is that Dae-su has been the focus of the film throughout. By keeping him in the centre of the action, and maintaining such close proximity to the lead character, the audience seems to have little choice but to empathise – despite the fact that as a character he is far from likeable. As the film progresses, it’s easy to see why one of the images flashed on Dae-su’s television is that of Frankenstein’s monster. The physical transformation of Dae-su, which takes place over the course of his captivity, is enormous. As well as the home-made tattoos and plethora of scars adorning his body, Choi Min-sik manages to imbue his character with a ragged anguish, which seems live in every crease and wrinkle of his face. The shoddy black hair framing his expressive face more than hints at the element of insanity that will be necessary for him to complete his vengeful mission. It’s quite a performance. The scene which caused so much controversy occurs in a sushi restaurant. Having made the acquaintance of young female chef who will assist him in uncovering his personal mystery, he orders and eats a live octopus. We see the creature wriggling, its tentacles snaking around his mouth and into his nose as Dae-su presumably makes a statement about what he is capable of. Ordinarily the BBFC would never pass a film in this country which shows genuine animal cruelty, so the fact that the scene remained uncut in Britain (and that the actor himself admitted that four octopi died in filming it) was both unprecedented and understandably divisive. As a demonstration of desperation, it works amply on behalf of the character and a filmmaker who must have revelled in the publicity. There are some wonderful set-pieces as violent revenge is wreaked – often with either end of a claw hammer. One scene in particular is epic in its scope. Dae-su is faced with a corridor of tool wielding attackers yet emerges victorious, albeit bloodied and bruised, after a masterfully choreographed fight sequence shot in one impressive take as the camera tracks the action left and right. In the midst of graphically depicted violence lurks the villain of the piece. He’s an almost pantomime presence, from his mannered demeanour and platinum blonde bodyguard to his implausible disability: despite his youthfulness he is fitted with a remote-controlled pacemaker with which he can end his own life whenever he chooses. The mastermind behind the whole plot holds the aces due to his ability eliminate himself from the storyline, thus leaving Dae-su without the answers he craves. The second half of the film is more formulaic than the first, but does not fall into the trap of becoming predictable thanks to the romance between Dae-su and Mido, the sushi chef. This beguiling relationship forms the heart of the film, and there are definite echoes of Luc Besson’s Leon in the interplay between the damaged anti-hero and the young girl – a mutual dependency which cannot be fully explained yet is touching in its tenderness. The denouement is unexpectedly low key given the high octane way the film opens, but the languid unravelling of the plot has a nasty sting in the tail. It’s difficult to know where the audience is supposed to have sympathy in this morally murky world, and Dae-su’s passivity seems to be a deliberate part of the opaque but slightly muddled ending to a thought provoking and visually arresting piece of work. This is a visceral yet stylish film which succeeds in presenting morally ambiguous characters and letting the audience make up their own minds. Unfortunately, the strength of the visuals cannot carry the relative weakness of the storyline as far as the end credits.